Pat Benetar was talking about something else when she said that. High-Intensity Interval Training (HIIT) is one of the most effective workout to burn up all the sugar in your system and quickly get you into a fat burning mode. The best part of a HIIT workout is that it gives your metabolism a boost like rocket fuel and your body will burn fat for hours after the workout is over. What are HIIT Workouts? It’s a type of exercise where you do repeated short quick bouts of an exercise which uses your upper and lower body at the same time elevating your heart rate to maximum in seconds. It is then followed by a brief recovery period and you repeat the sequence several times in a row. So you perform the exercise such as jump squats for a full minute and then rest for 10 seconds and then repeat two or three times the same exercise. Continue with other exercises for a total duration of 20 to 30 minutes. For those of you who complain that you don’t have time to exercise, you can throw that down the toilet as you only need 20 minutes a day and everyone has that. Wouldn’t you give up 20 minutes of your day so that you can get great results super fast?! Try this workout: Perform each exercise for 50 seconds and then take a 10 second break in between them. Repeat the sequence 3 to 5 times. HIIT workouts are a great way to “shock” your muscles and to kick your body into high gear, allowing you to continue experiencing results and improvements after your body has gotten accustomed to your usual workout routine. Stay tuned next week for another type of HIIT workout called Tabata! It is fun and brutal and you can get your workout in under 15 mintues!!! In the meantime, if you have any questions, please email me at tina@tinamcdermott.com or call 410-570-5170. Wow, what an exhilarating fun time we had at the Adventure Park at Sandy Spring. 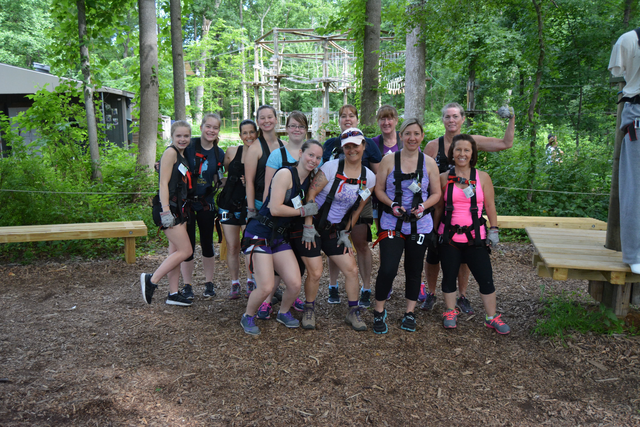 We climbed trees, zip lined, crossed over treacherous wires and wooden planks and tunnels and anything else they could think of to challenge us to the core of our being! And we would all do it again and again it was so much fun!!!! Take the family, take your friends, and just do it! I guarantee you will have the time of your life!